Wilderness conservation is a complex issue! It is not easy to find a comprehensive definition covering the very diverse subcontinent of Europe. Nevertheless in the last several years, we saw a remarkable progress regarding this issue. Europeans woke up and agreed not only to protect the European Wilderness Heritage but also to protect this wilderness! Surprisingly, the responsible experts were also able to agree to common definition on what constitutes wilderness in Europe. The result of this process was the concept named: Wilderness Continuum. The concept is based on measuring variation in the wilderness quality by using several indicators that represent essential characteristic of wilderness such as the level of human modification (e.g. extractive use), attributes of remoteness or its visual naturalness. These indicators permit us a precise assessment of the wilderness resource, revealing those factors which contribute to or compromise wilderness quality. After 14 years of working with this and its predecessor definition we can safely say that the 100% pure wilderness concept with absoutely no human intervention, no extractive use or no settlements, infrastructure or visual disturbance turned to be too demanding for several areas and regions in Europe such as Scandinavia or many Mediterranean and central European countries! This experience can also be seen in other continents. Even in North America this pure wilderness concept faces similar challenges. The U.S. Wilderness Act, signed into law in 1964, the U.S. Eastern Wilderness Areas Act signed into law in 1975 or the Alaska National Interest Lands Conservation Act (ANILCA) signed into law in1980 are dealing not only with different territories but also interpret wilderness in slightly different manner deviating from the strict European definition. The European Wilderness Society sought a definition schema that would allow the strict definition but also permit areas with lesser quality to participate in the wilderness continuum. 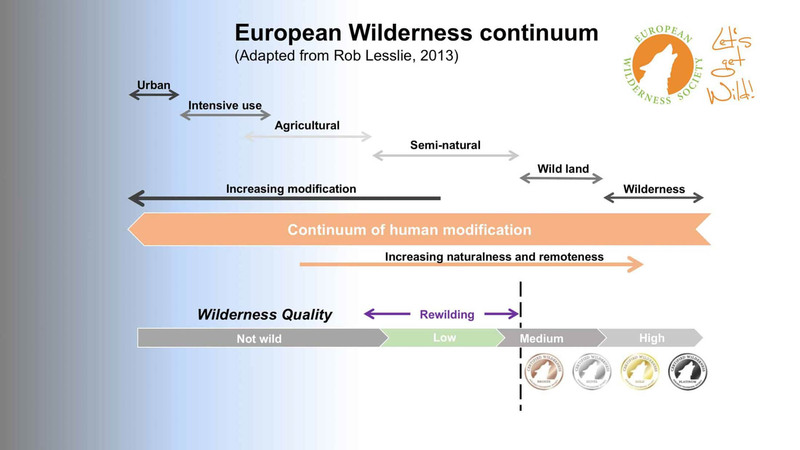 In the case of Europe the advantage of 4 wilderness categories (Platinum, Gold, Silver and Bronze) is to create a tool to implement European wilderness agenda in the very diverse regions with their individual characteristics and simultaneously motivate park managers to a step wise approach to improve their wilderness. The strict definition is our Gold Standard, while the Bronze and Silver Standards are regions aspiring to achieve the Gold Standard but still having to deal with the remains of human intervention. What is the wilderness continuum?